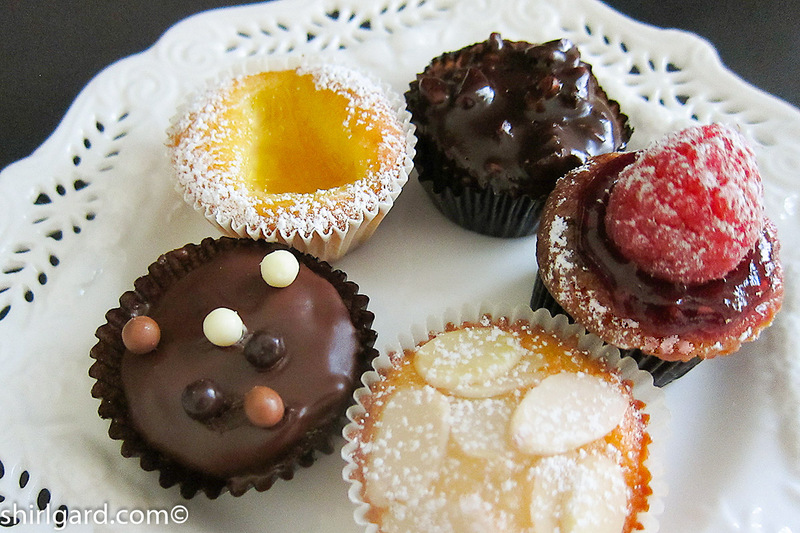 Early in my pastry career, I had the chance to combine a week of classes at Lenôtre with a vacation in France. 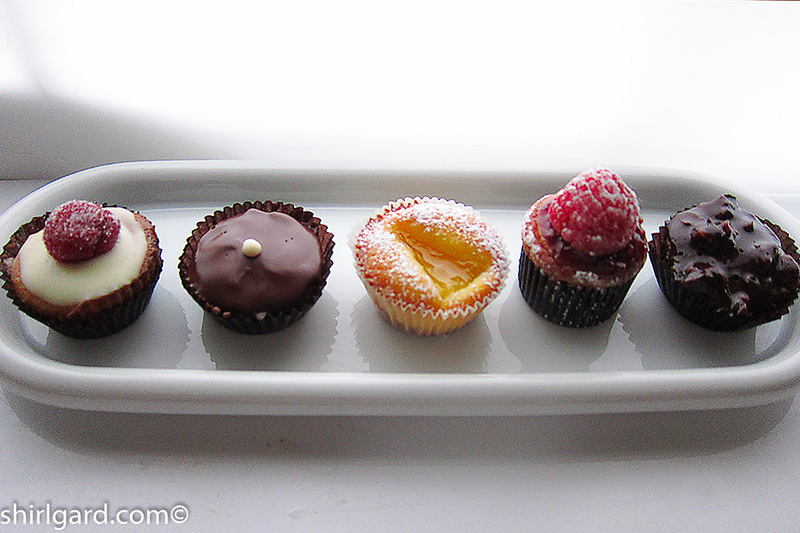 The vacation was very memorable but the highlight was the Petits Fours (literal translation: small oven−or tiny pastries also known as mignardises) class, held at the Lenôtre professional pastry school in Plaisir, located near Versailles. 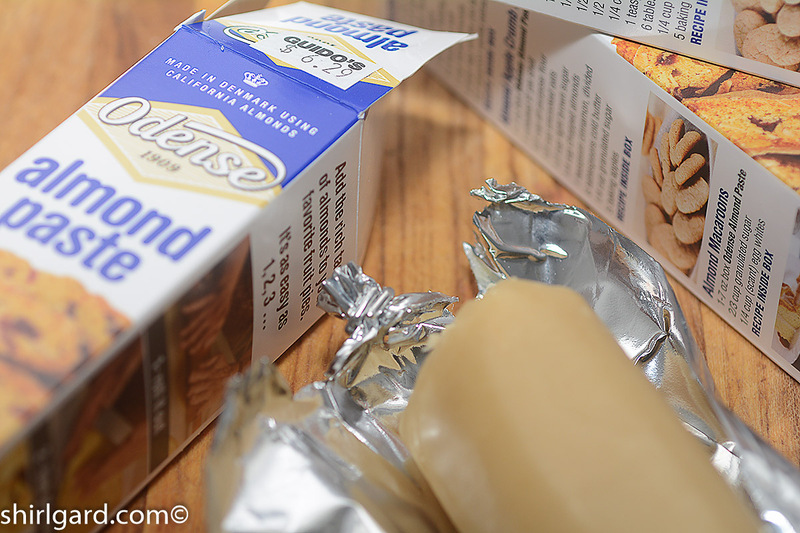 Lisser la pâte d’amandes avec les oeufs, puis ajouter le beurre en pommade. Additionner le miel et les drops. Cuisson à 180° C.
My week at Lenôtre started with Chef Gerard Gautheron, an M.O.F., reviewing a notebook full of over fifty recipes similar to Amandina, with intriguing names like “Le Brut de Pralin”, “Le Pave Pistache”, and “La Bonbonnière aux Fraises des Bois”, all classified in the French pastry lexicon as petits fours and divided into two categories: petits fours frais (fresh−with mousse or other soft components) and petits fours sec (dry−like cookies). 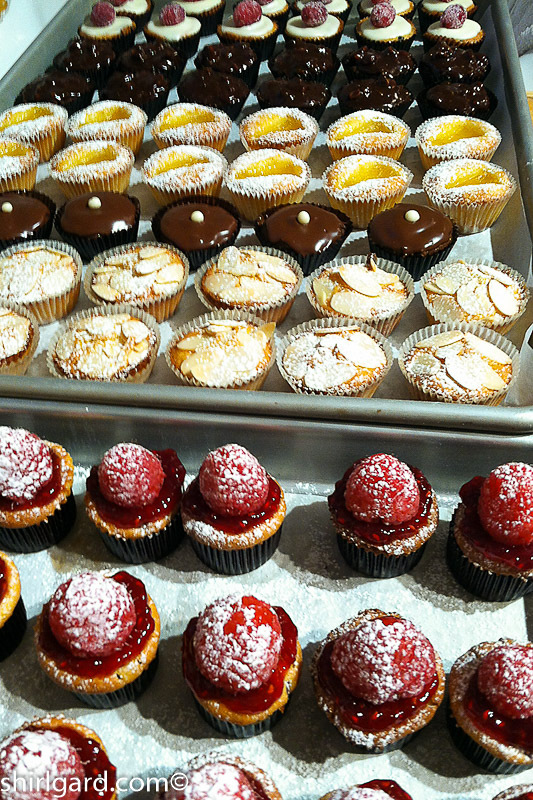 Our class of four people (all working pastry chefs) would be making all of them; it was to be a very “hands-on” class. 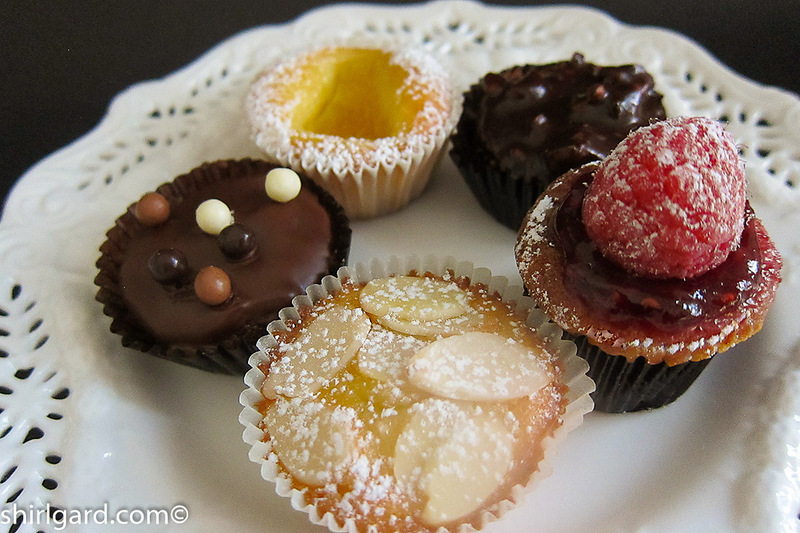 Of the four students, two were women (a woman from Malaysia and myself) and two men, both from pâtisseries in small French villages. The class was taught in French and everyone in the class spoke French except me. I knew a little bit, just enough to be able to figure out what a recipe might be saying, but I was in no way fluent. The woman pastry chef from Malaysia, who spoke both English and French, helped me tremendously. The chef spoke a little broken English, but what helped the most were his excellent demos where he showed us how each recipe was to be mixed and baked, the techniques we would be using and, in the end, how to garnish and present it in the most beautiful and eye-catching way. You may think that the language of pastry is French, but what I learned in that class is that truly the language of pastry is visual: seeing it. No amount of words, either in English or French, could ever replace the images that I took from that class. I am not going to pretend that this class wasn’t a challenge. 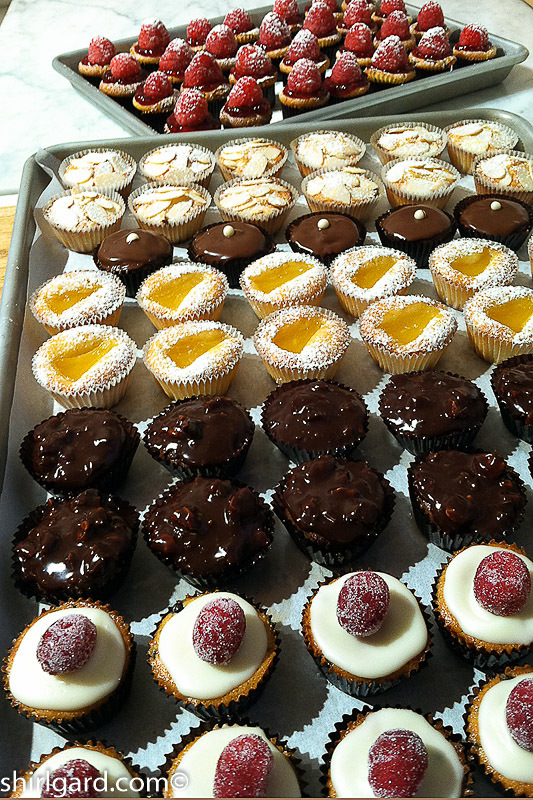 Even though I had been pastry chef at Wheatleigh (Lenox, MA) for a few years when I took that class, there were so many new and different things to absorb. It was the most precise environment that I had ever been exposed to: the chef (the first M.O.F. that I had ever taken a class from) was very particular in the way he talked and handled the ingredients for a recipe. 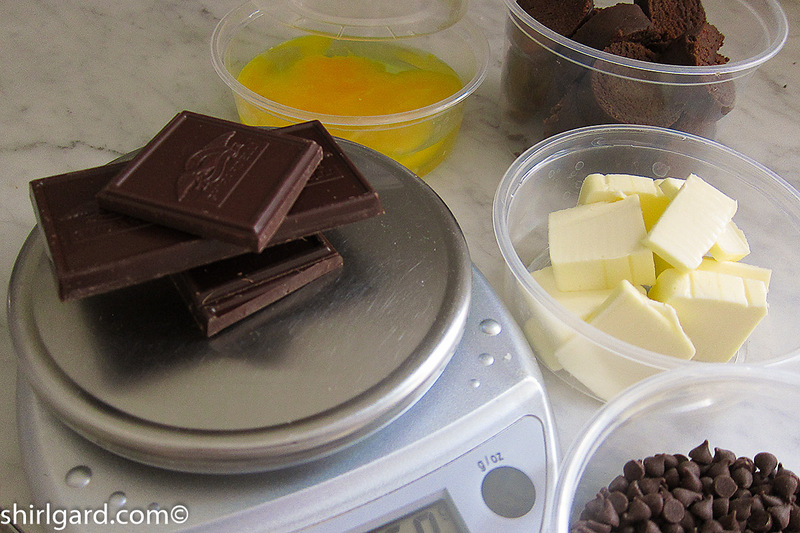 The recipes were exact−all in grams−which I had not previously been using in my recipes. To answer the question of “how exact?”, just look at the honey in the recipe, which is written to the half-gram, a mere drop of honey. 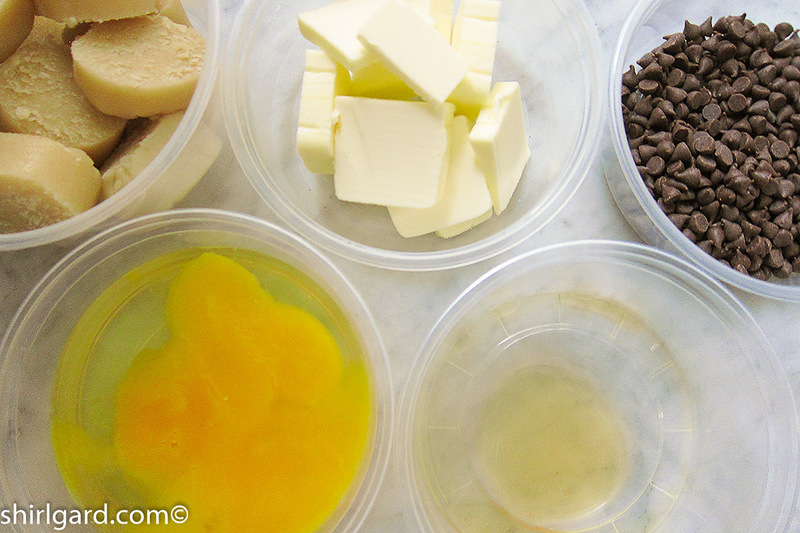 We started out by scaling out a group of recipes that we would be making the next day; this meant carefully weighing each ingredient for a recipe and collecting everything on a sheet pan (yes, with a label−the name of the recipe). 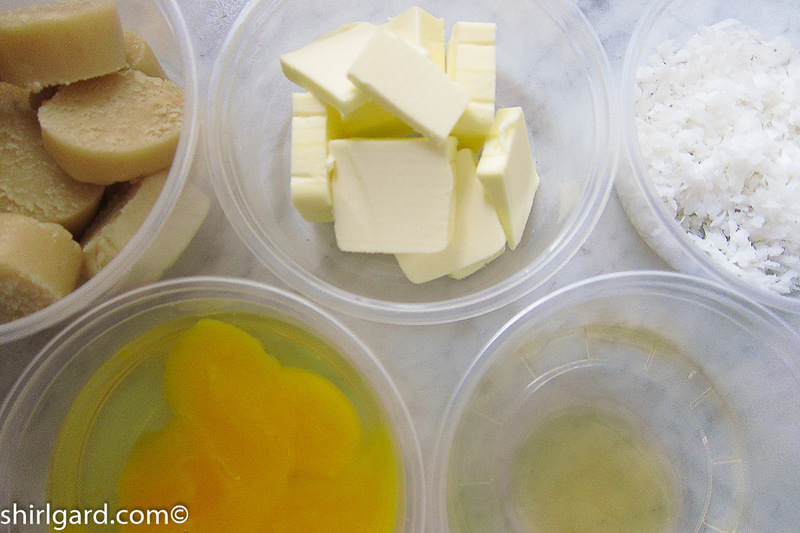 This is called a mise en place. We were off. Also, the kitchen was organized meticulously, with labels on every drawer and ingredient container. It blew my mind that there were big stainless steel drawers dedicated to different types of almonds. I will never forget pulling open the drawer labeled “AMANDES HACHEES” in bold capital letters. I fell in love with those finely chopped almonds: perfect tiny pieces all the same size and shape. Another drawer said “AMANDES EFFILEES”, which we know as sliced blanched almonds. Drawer after drawer, container after container: all perfectly labeled. 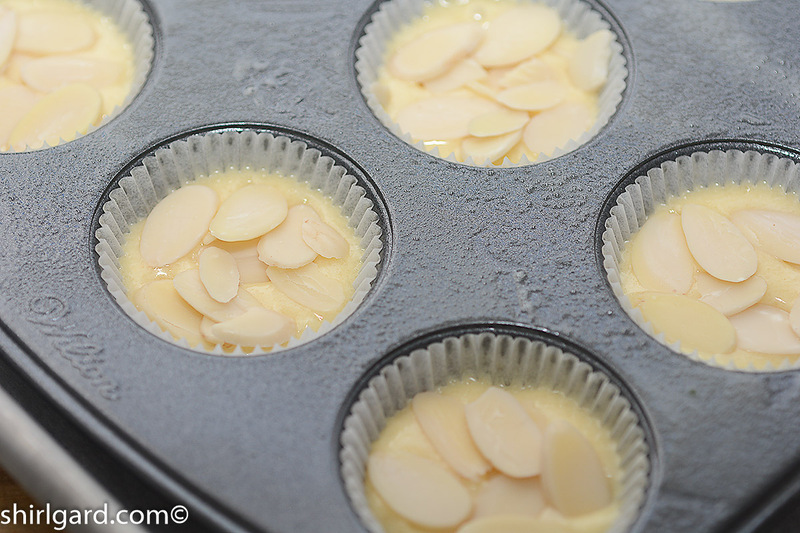 Process a little bit of egg with Almond Paste until smooth. 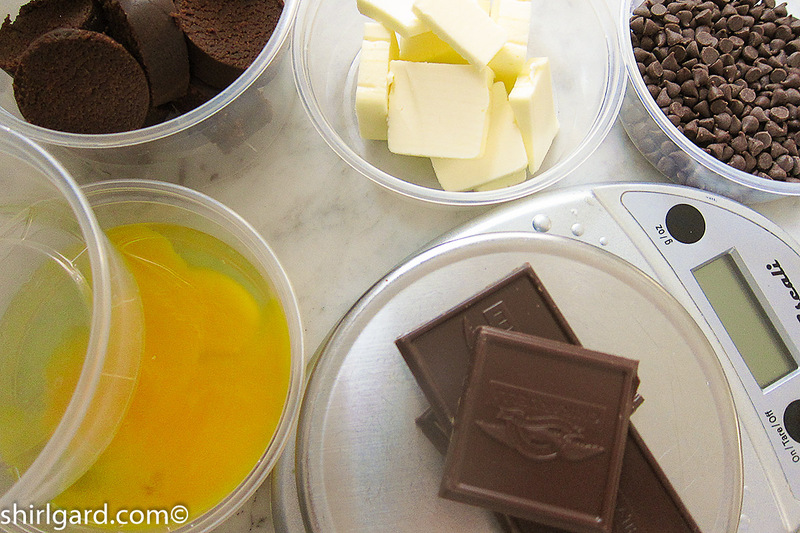 Add rest of ingredients except chocolate chips and process until smooth. 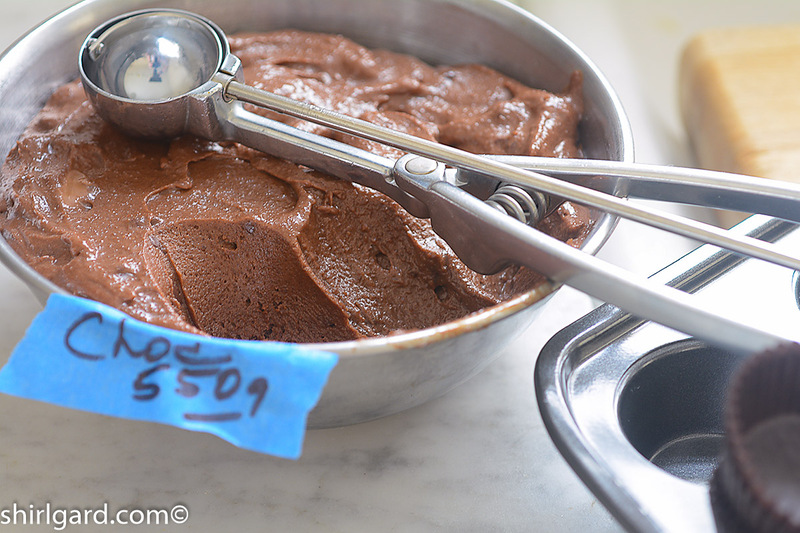 Finished smooth batter before chilling and adding chocolate chips. 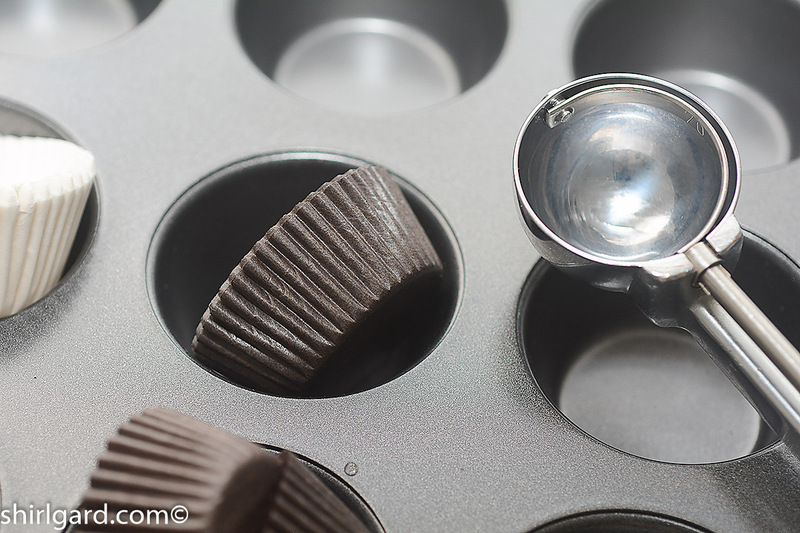 Mini Muffin Pan with Paper Muffin or Candy Cups & #70 Scoop. 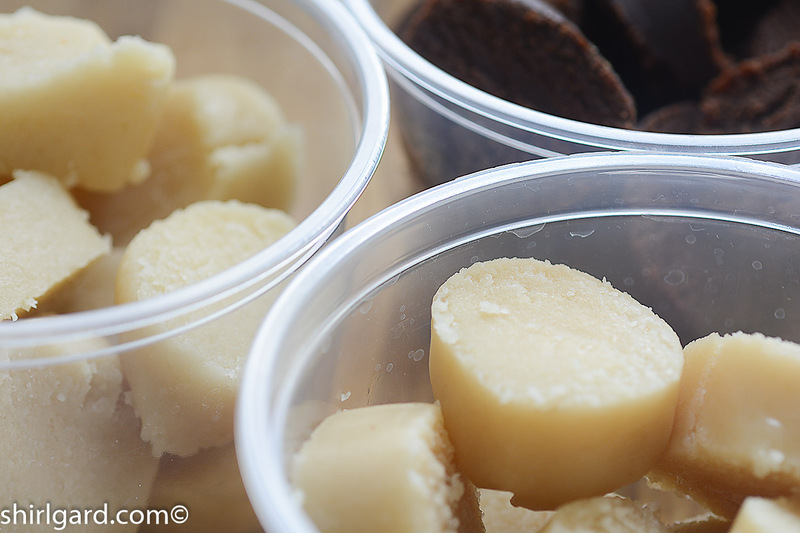 Use a #70 Scoop (about 1 Tablespoon) or scale at 15 grams each. 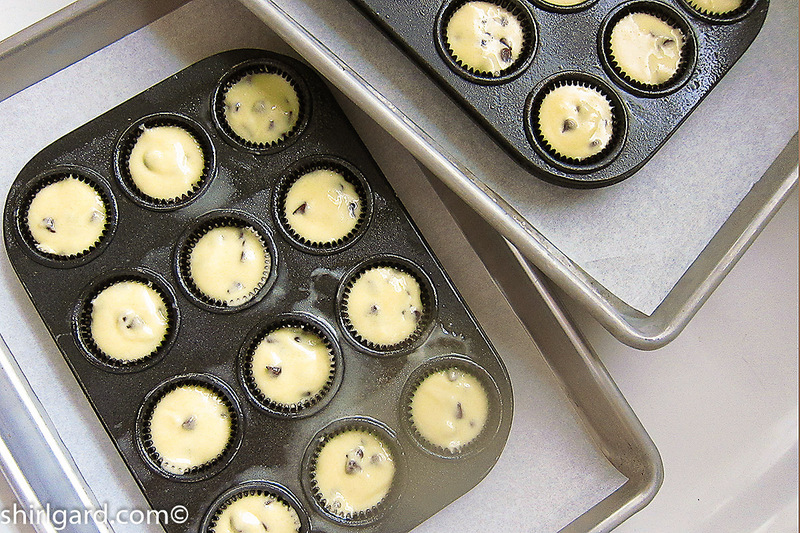 Filled mini muffin pan ready to bake. There was not a speck of dirt anywhere in the Lenôtre kitchen−the kitchen was ultra clean−all stainless steel and tile. I came away from that class changed forever: more precise, more organized, more committed to “clean”, and totally converted to metric. 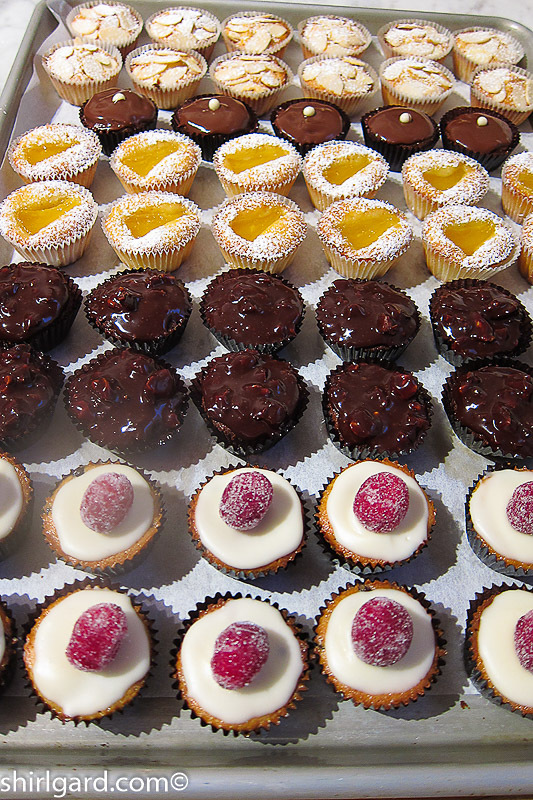 In addition, I came away with fifty great recipes, unforgettable images of what they were supposed to look like, and what the standards for petits fours should be. 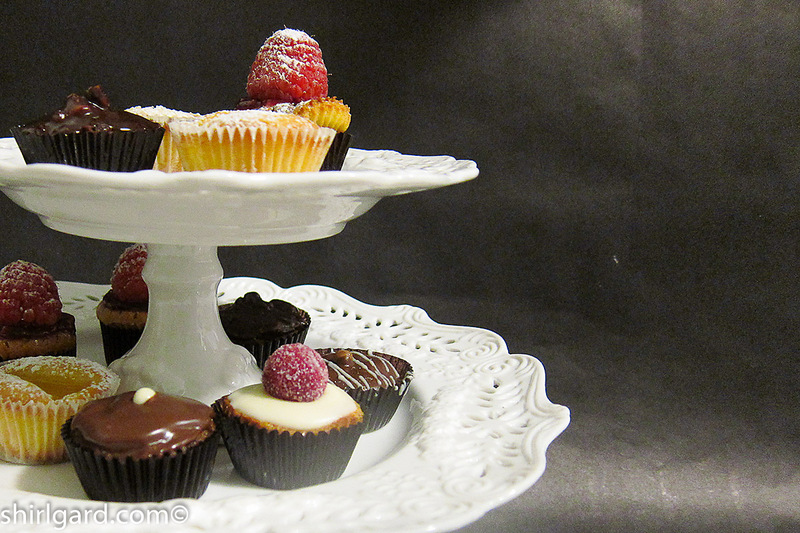 The Friday of the class was spent garnishing and finishing everything that we had made during the week: a chocolate curl here, a raspberry there, a little powdered sugar. Each recipe had its own particular garnish. 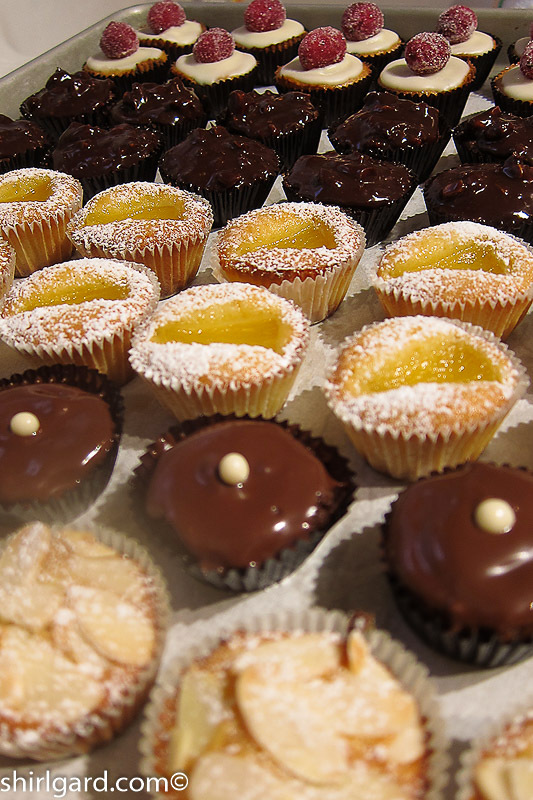 The petits fours buffet (the “frais” separated from the “sec”) with hundreds of tiny pastries−all laid out in precise rows−that Friday morning is definitely one of those unforgettable images, confirming that “visual” speaks to you like a language: in this case, the language of pastry. 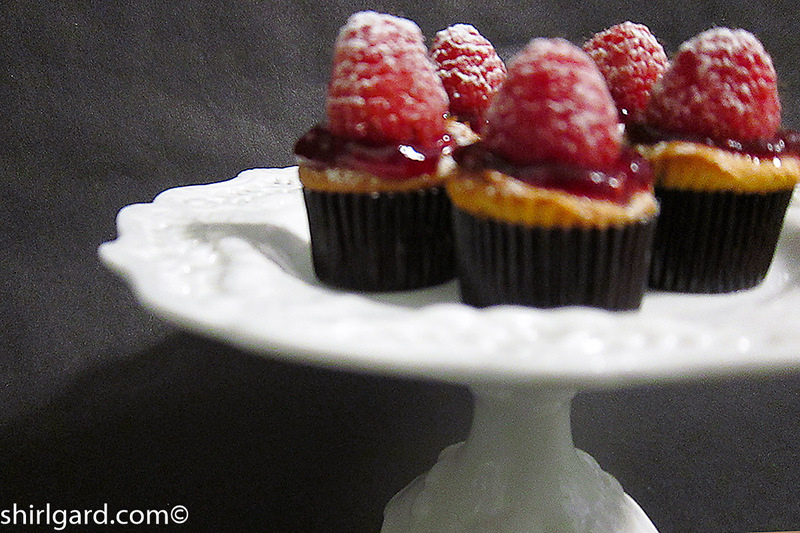 The original Lenôtre way: an almond paste batter with mini chocolate chips, and garnished with fresh raspberries, raspberry jam, and powdered sugar. 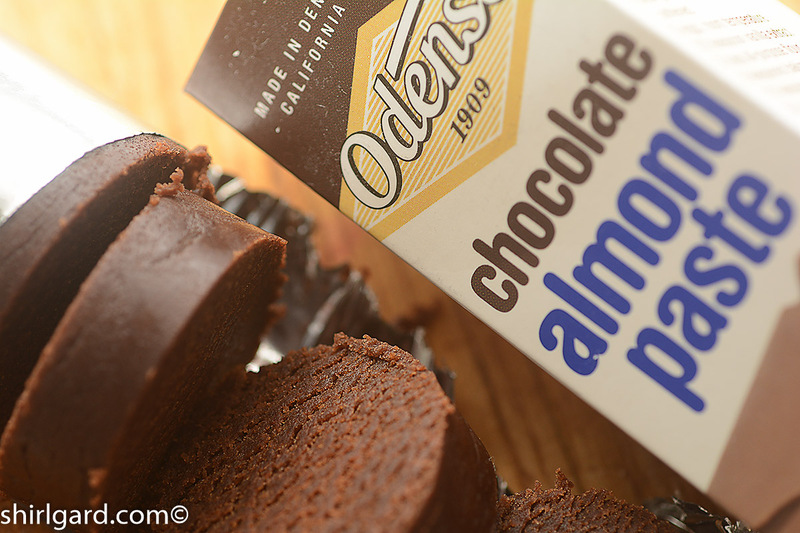 Or, using Chocolate Almond Paste (Odense) instead of regular almond paste and throwing in a little melted chocolate for a chocolate version. 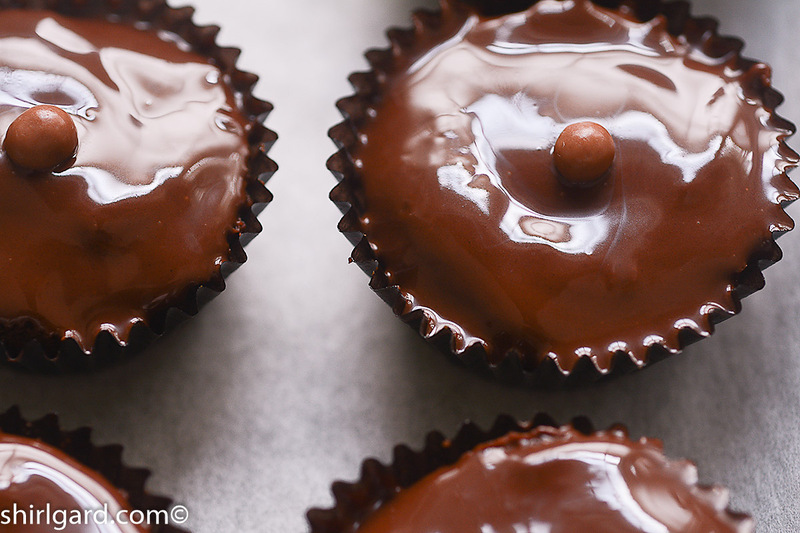 These are like tiny “almond-y” moist brownies that you can top with melted chocolate or ganache. Or, switching the chocolate chips in the batter to coconut and topping with pineapple or sliced blanched almonds. 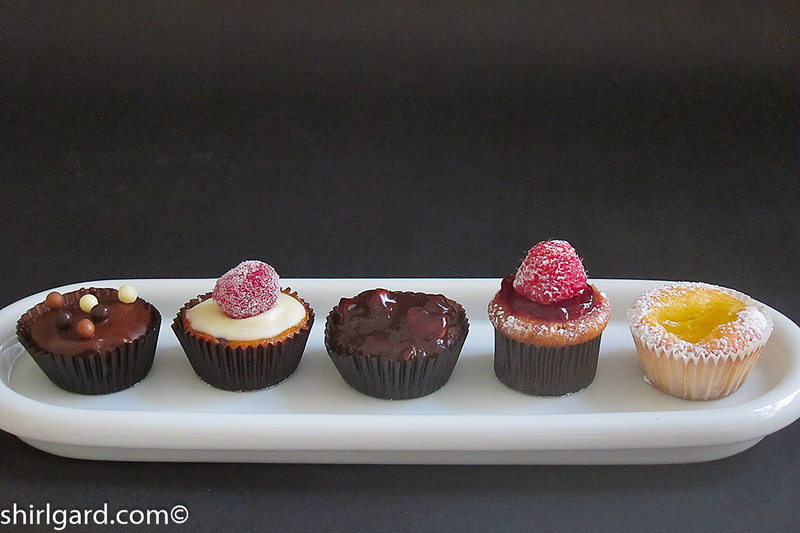 They are all tasty little morsels and look great when presented as an assortment. 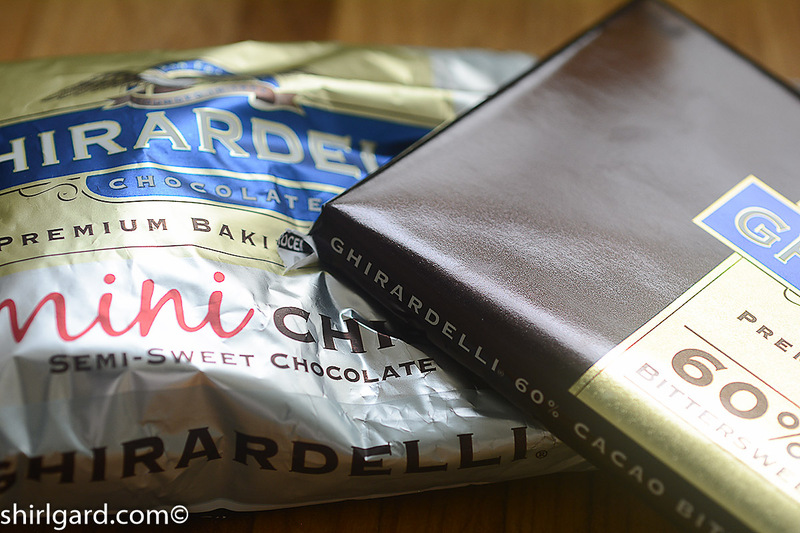 Make a batch of each and let your creativity run wild. Enjoy! 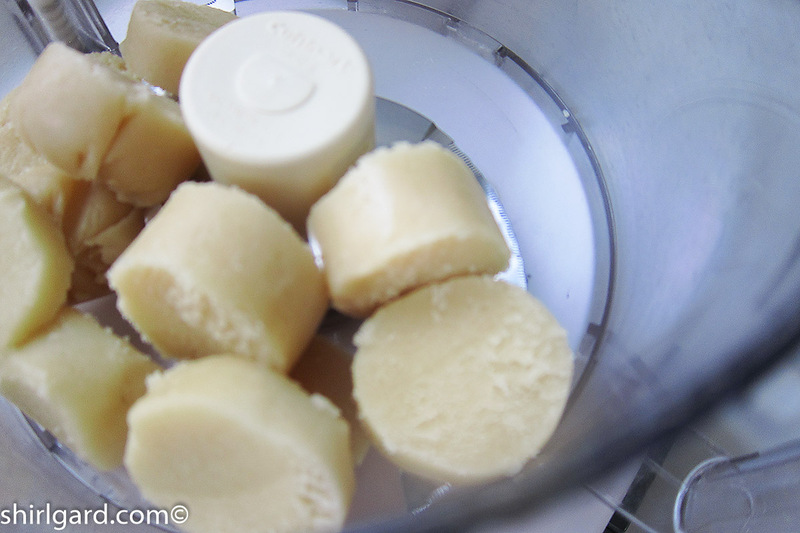 This is such an easy recipe to make in a food processor. 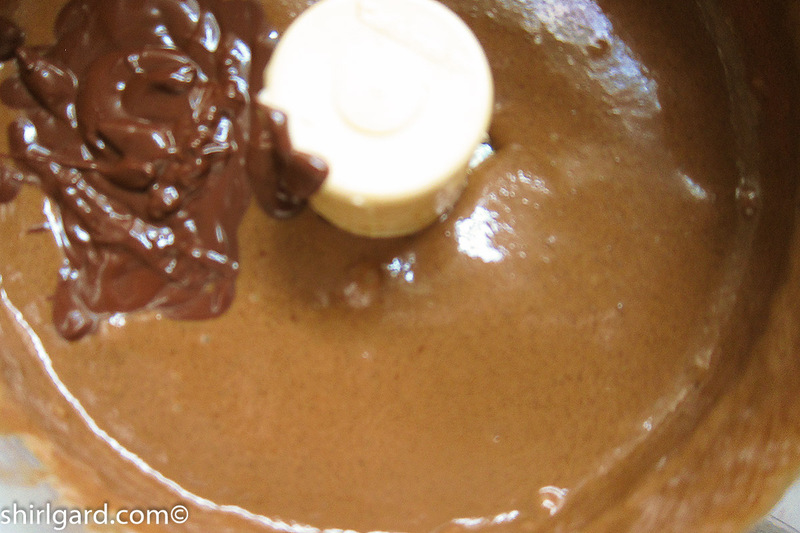 It's a simple recipe, really, wtih only five ingredients in the Basic Recipe. 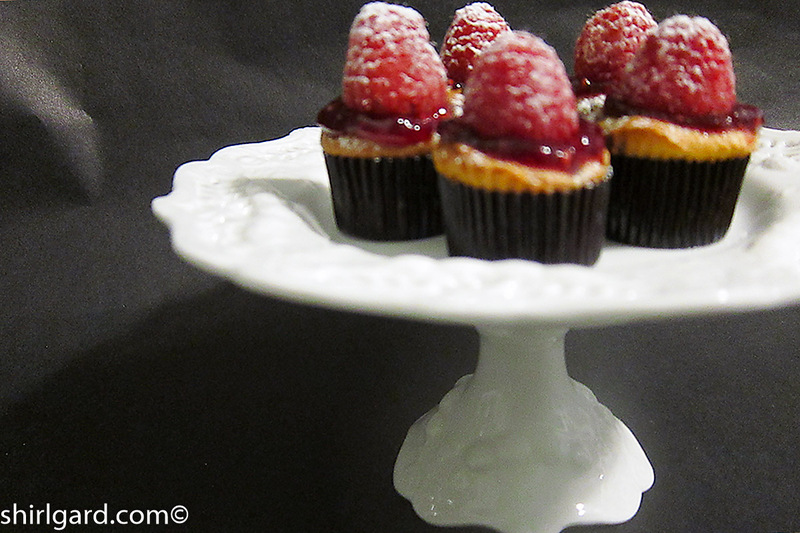 The original version of this recipe was the Variation #1 below, with the raspberries: Raspberry Amandinas. I've given two other variarions here: one for Chocolate Amandinas, and one for Coconute Pineapple Amandinas. 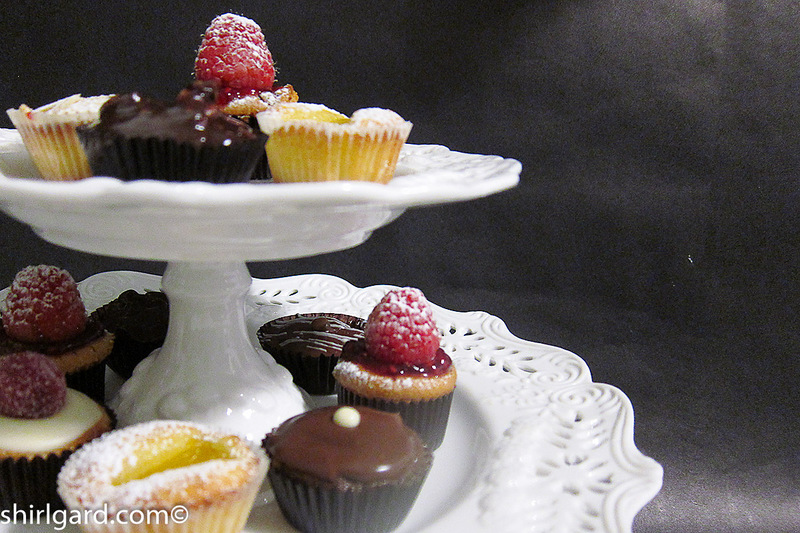 There are other reasons to like this recipes besides how easy they are to make: the little cakes are very moist and tasty, and by happenstance, gluten-free, since the main ingredient is almond paste with no flour. 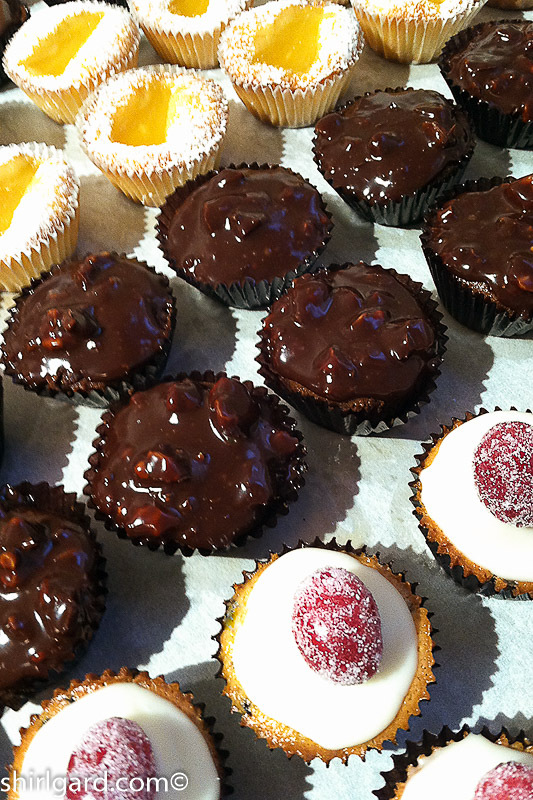 Also, they just invite creativity when it comes to decorating them, with limitless possibilities. 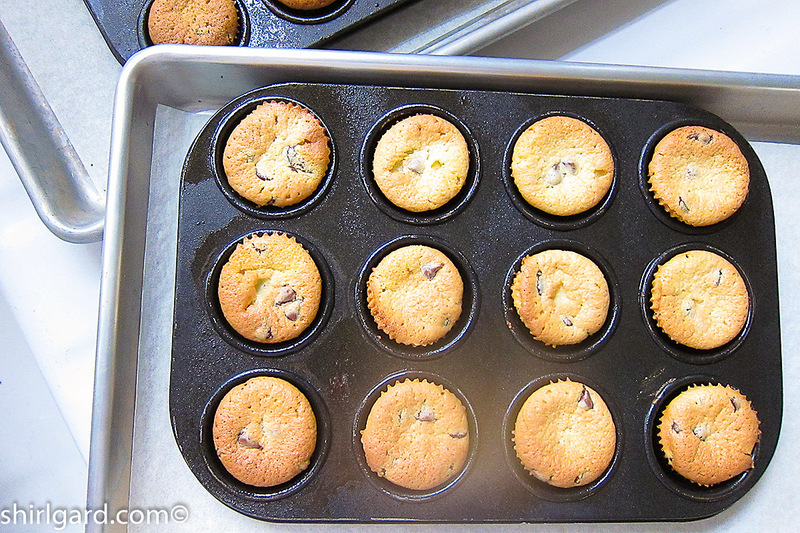 SET UP mini muffin pans on sheet pans. 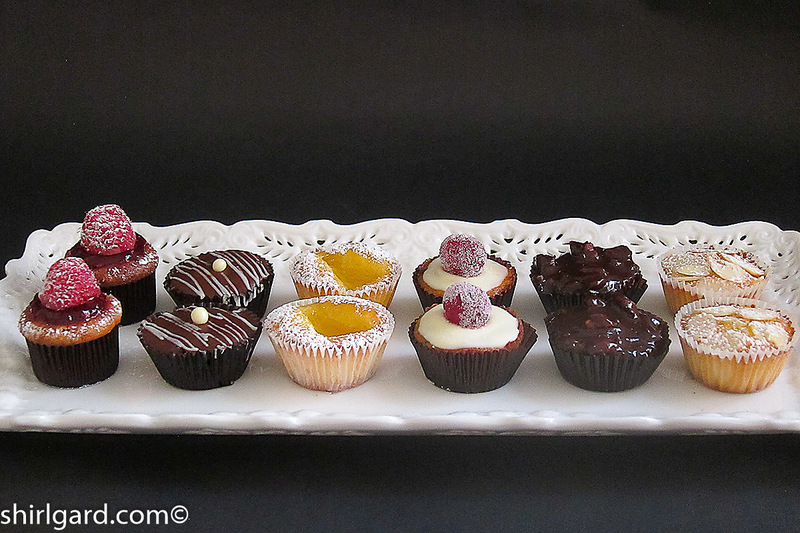 Line with mini muffin papers (or brown or white #5 glassine candy cups). 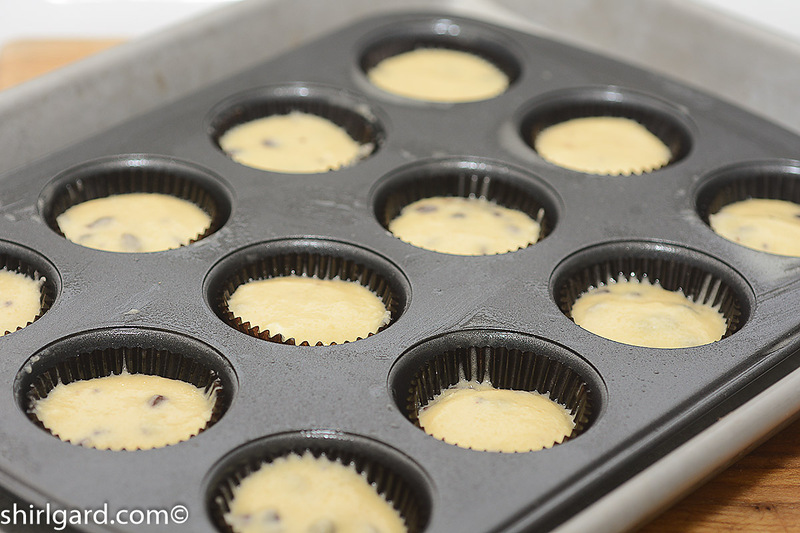 Note: mini muffin pans come in different sizes; use pans with the smallest cups you can find for this recipe. 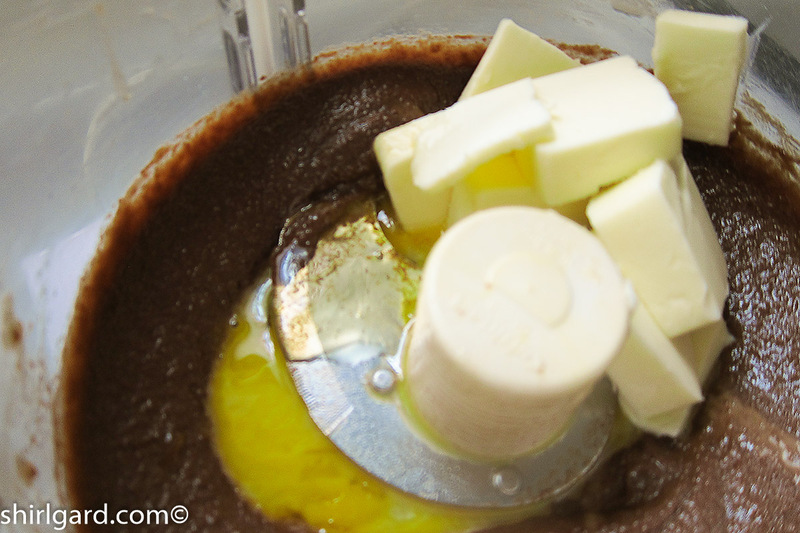 MIXING PROCEDURE: PROCESS all ingredients except chocolate chips in food processor: Start with almond paste and add a little bit of the eggs and process until smooth and lump free before adding the rest of the ingredients. 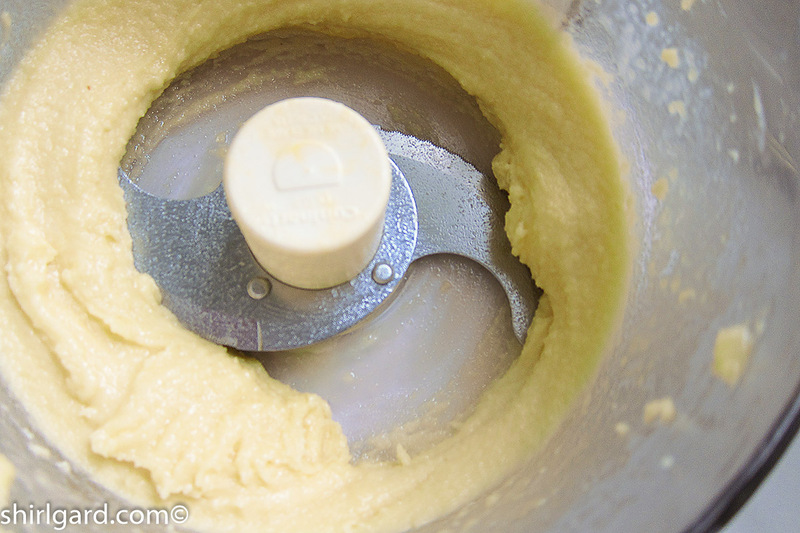 This is a standard procedure any time you are working with almond paste. 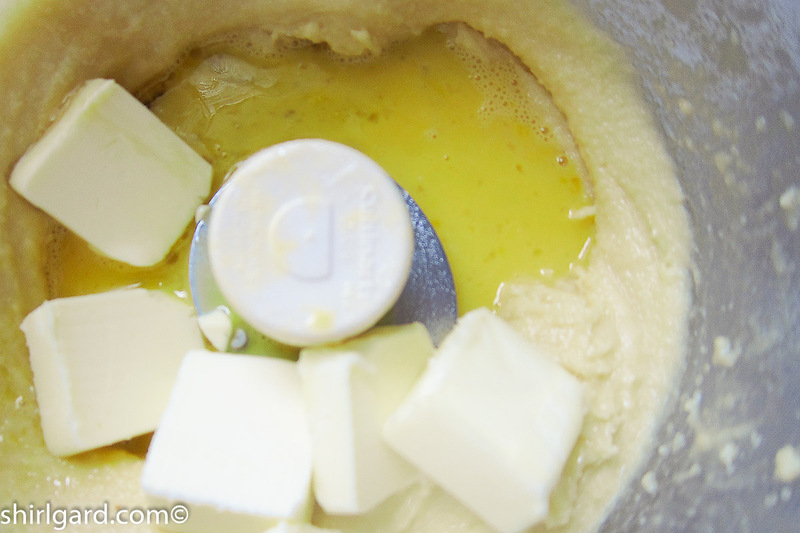 Add balance of eggs, butter, and honey. 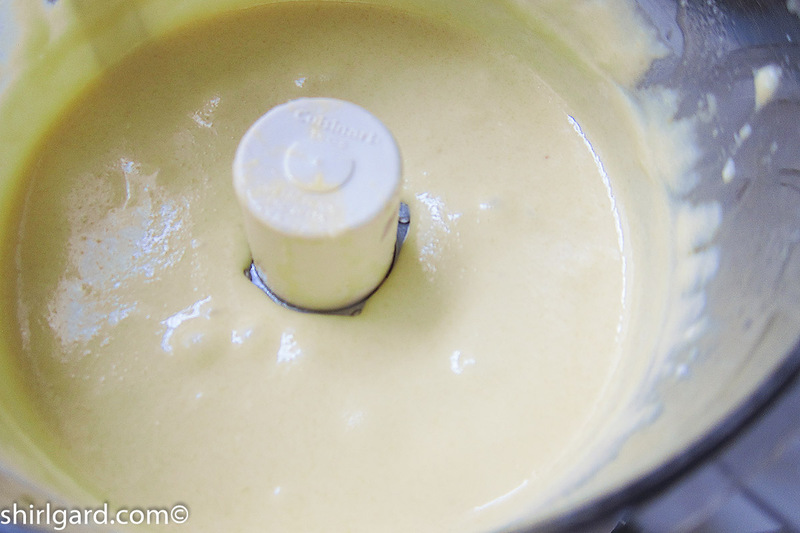 Process 2 to 3 minutes until batter is very smooth. 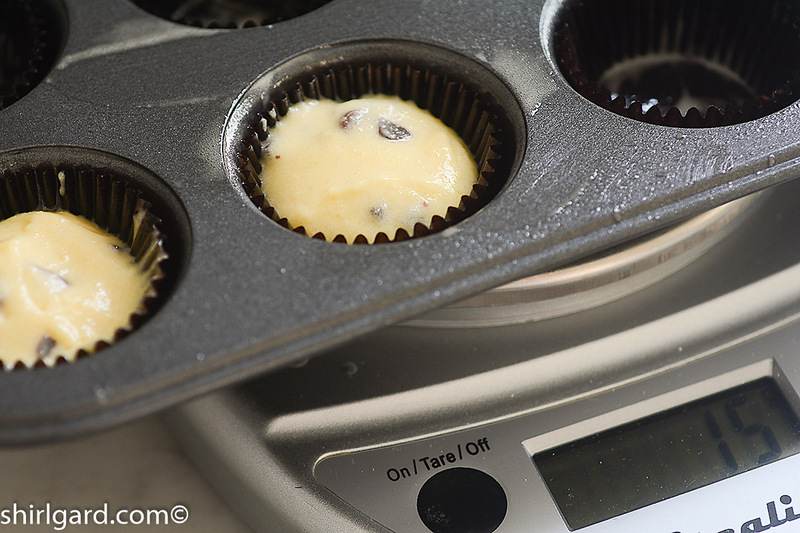 TRANSFER batter to a small bowl and refrigerate at least an hour before folding in the chocolate chips with a rubber spatula. 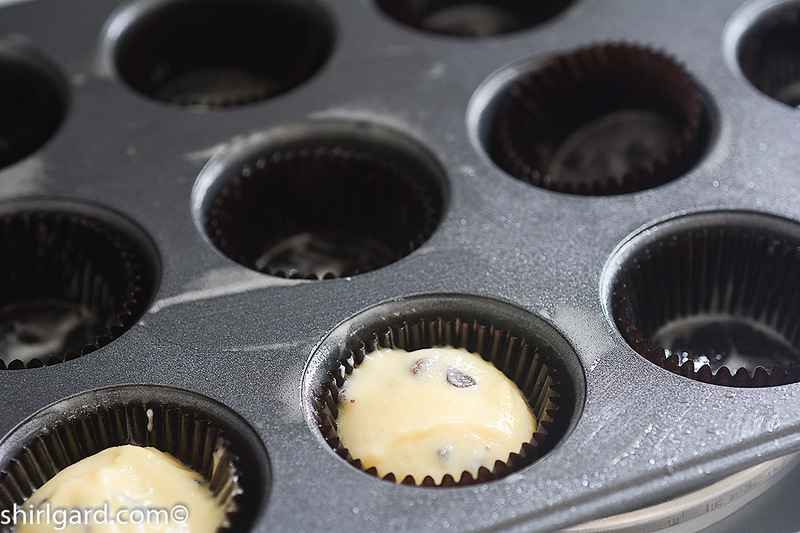 It is important to have cool batter before folding in chocolate chips or they will melt and turn the batter dark. 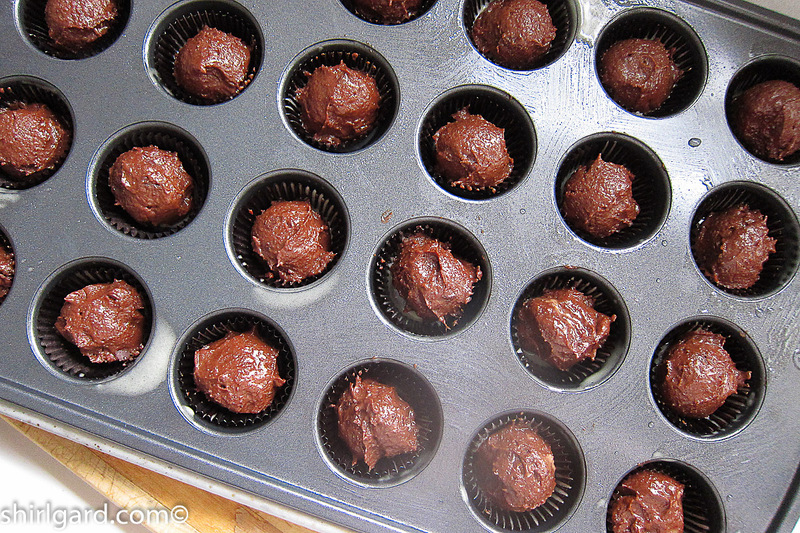 SPRAY the paper cups with a non-stick spray (Pam with flour) before filling. This is very important to prevent cakes from sticking to the papers. Spray one cup at a time, holding it in place with one hand while you spray with the other. PIPE (1/4" plain tip) OR SCOOP WITH A #70 SCOOP (About one tablespoon): If piping, fill to within ¼" of the top of the paper cups. 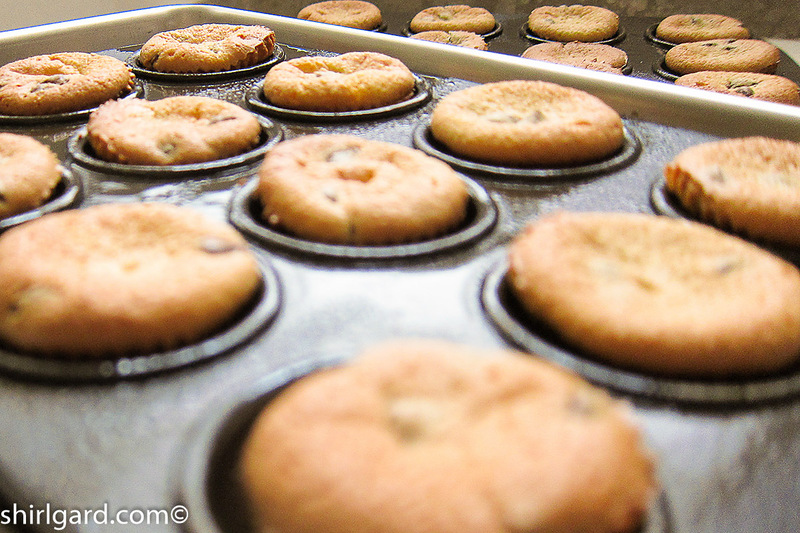 BAKE @ 400° F (204° C) for 10 minutes, rotate pans, and turn oven down to 375° F (190° C). 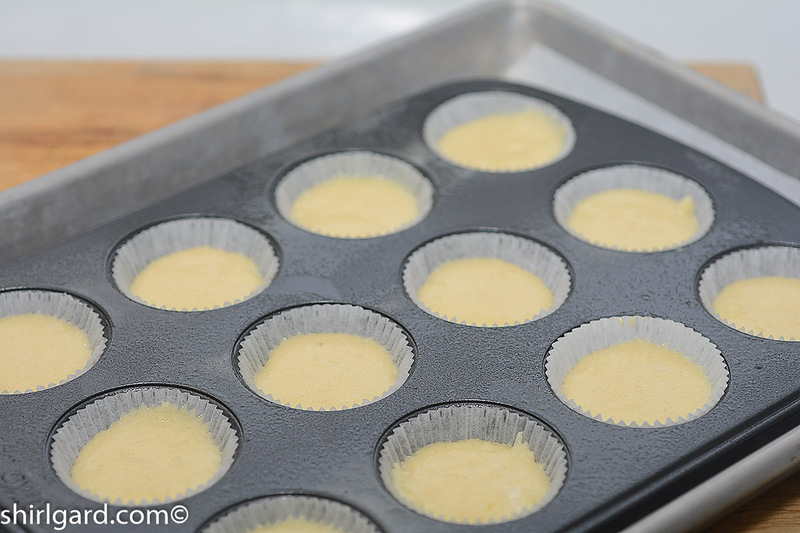 Bake another 5 to 8 minutes: total baking time 15 - 18 minutes, depending on the size of your mini muffin pans. 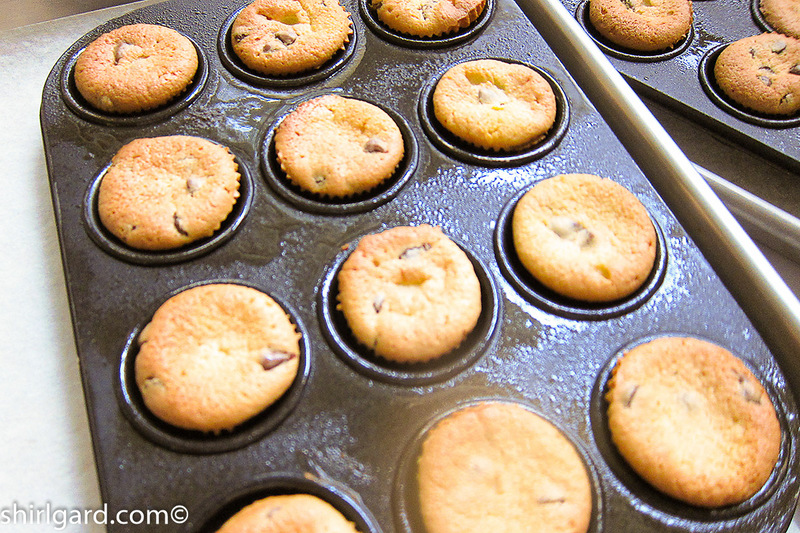 When done, the almond cakes should be puffed and a light golden brown, not dark, and a wooden skewer should test clean. 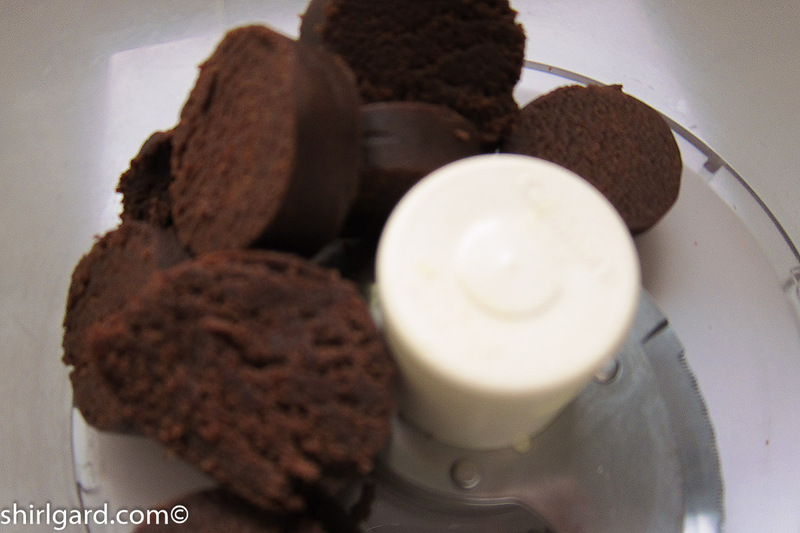 If making the chocolate version, take the cakes out of the oven a couple of minutes before the other versions, when a few moist crumbs stick to the skewer, like testing brownies. 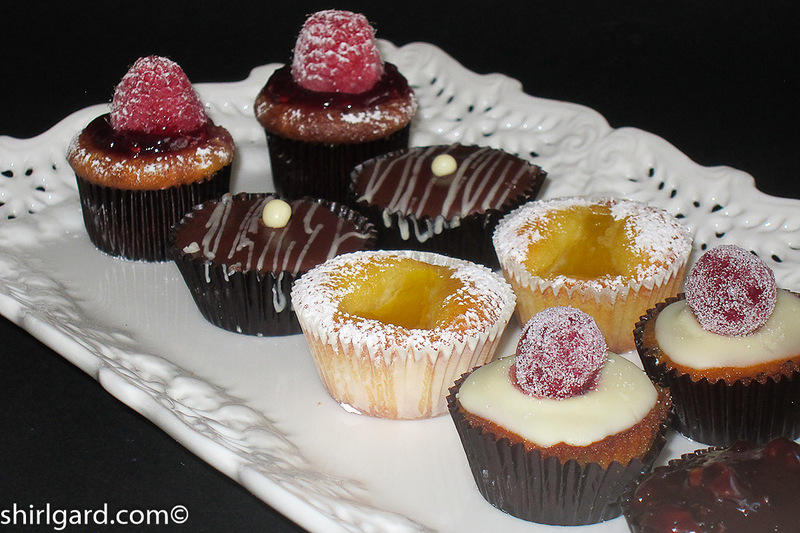 VARIATION #1: RASPBERRY BITE-SIZE ALMOND CAKES (RASPBERRY AMANDINAS) - Use the Basic Recipe as written above. 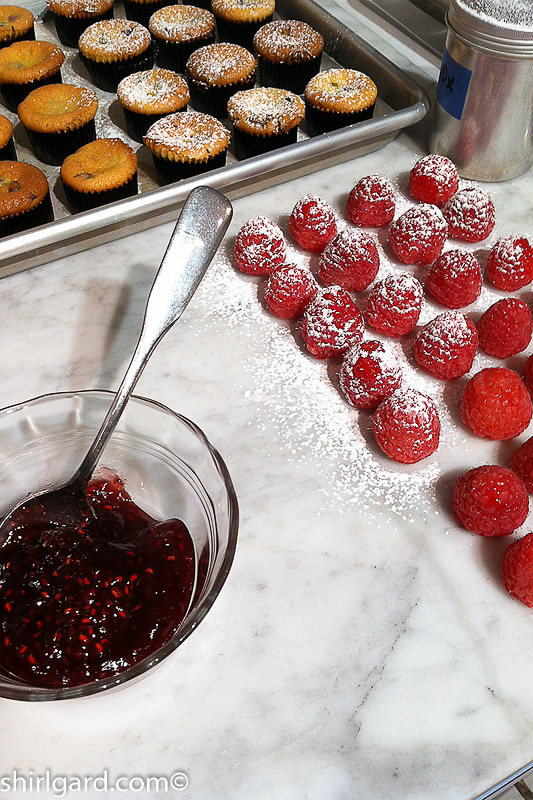 To decorate, you will need fresh raspberries, raspberry jam or preserves (I like Bonne Maman Raspberry Preserves), and powdered sugar in a shaker. 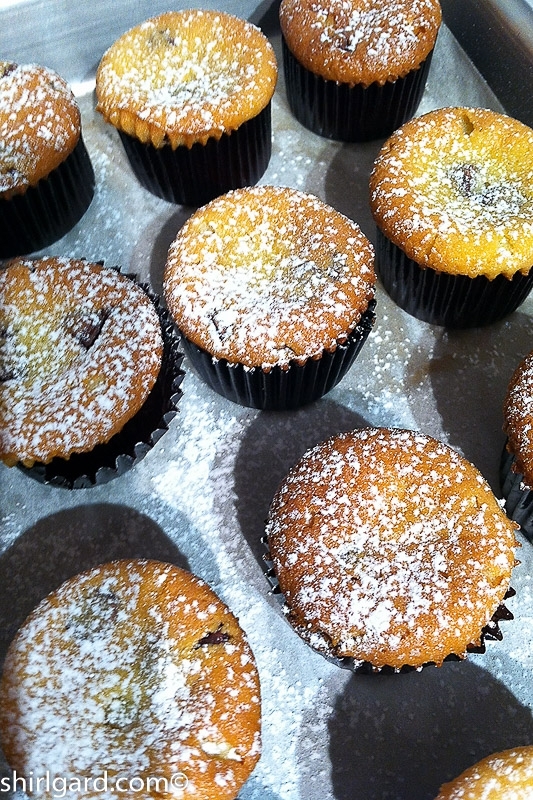 First dust the tops of the cakes with powdered sugar. 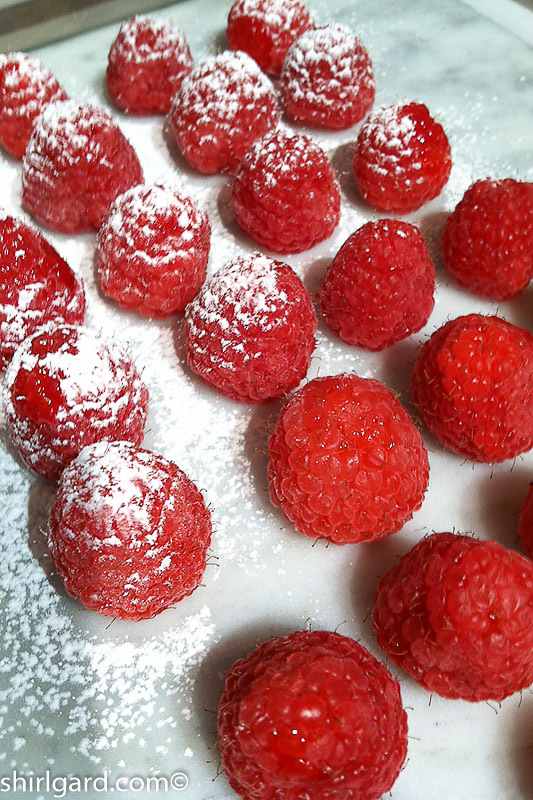 Set the raspberries on the counter (stem-side down) and also dust the raspberries with powderd sugar. 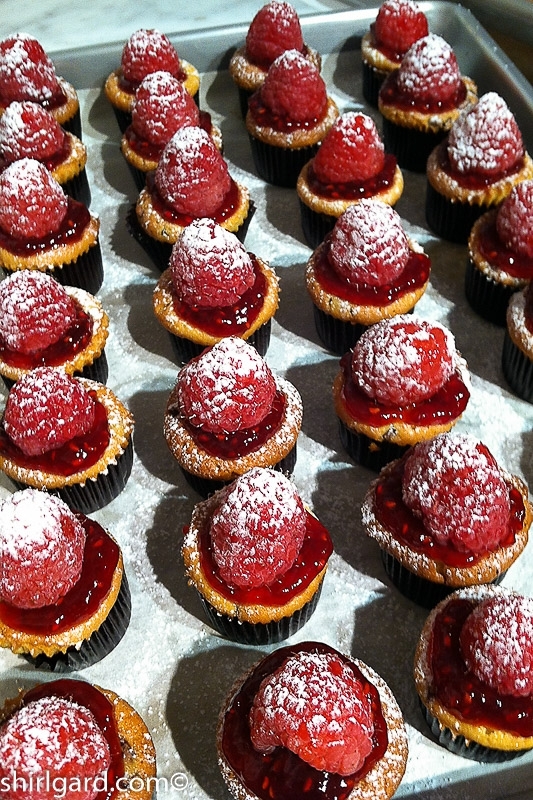 Using the tip of a teaspoon, place a small dollop of raspberry jam in the center of each cake. 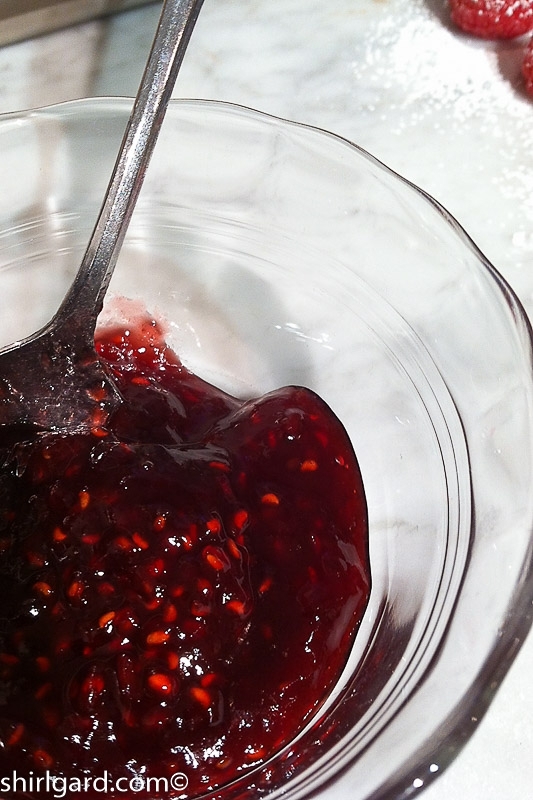 Press a raspberry (stem-end down) in the center of the jam allowing it to ooze out around the berry just a little bit. 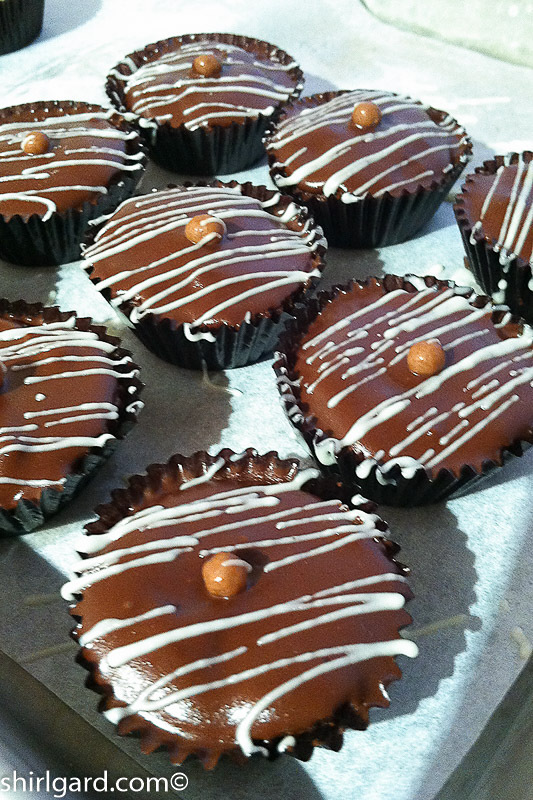 VARIATION #2: CHOCOLATE BITE-SIZE ALMOND CAKES (CHOCOLATE AMANDINAS) - For the chocolate version, make the Basic Recipe but substitute Chocolate Almond Paste (Odense) for the regular almond paste and add 60g (4 - 15 oz squares) melted bittersweet chocolate to the mixed batter in the food processor. Pulse in until well blended. 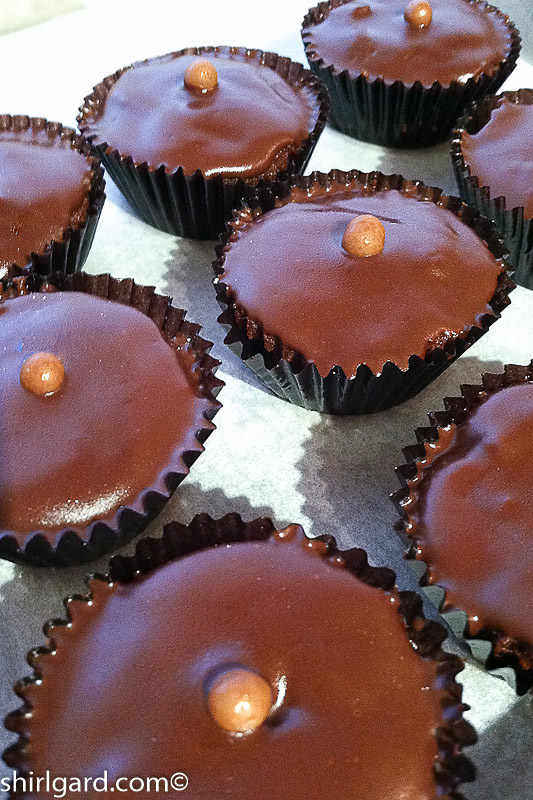 Garnish the tops with melted chocolate or ganache and Callebaut Crispearls (any color combination you like). 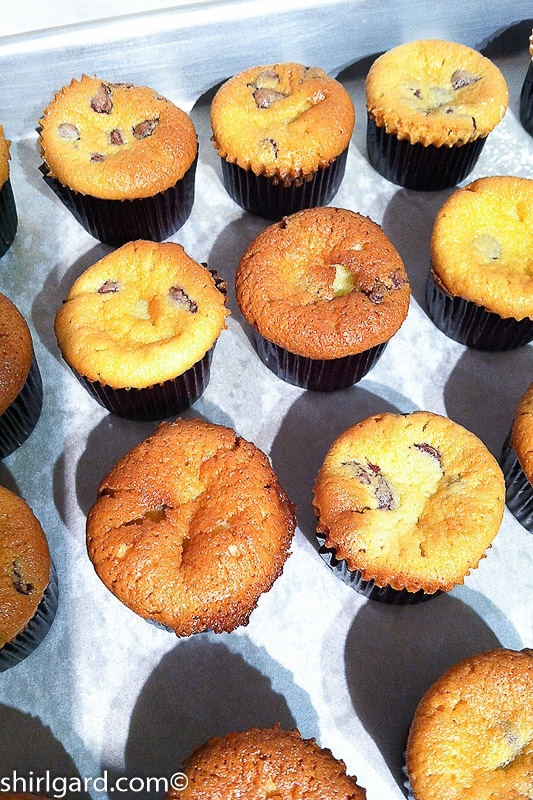 VARIATION #3: COCONUT PINEAPPLE BITE-SIZE ALMOND CAKES (COCONUT PINEAPPLE AMANDINAS) - Omit the chocolate chips from the Basic Recipe and add 45g (1/4 cup + 2 Tablespoons) Angel Flake Coconut to the finished batter. 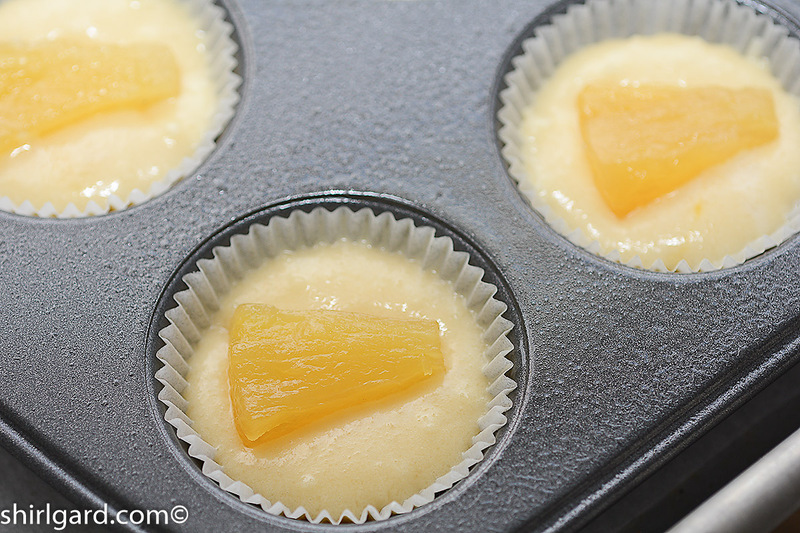 Place a chunk of fresh pineapple (or use canned and drained pineapple chunks) on top of each cake before baking. When baked, the pineapple will sink into the cake, so dust the edges of the cakes with powdered sugar when cool. 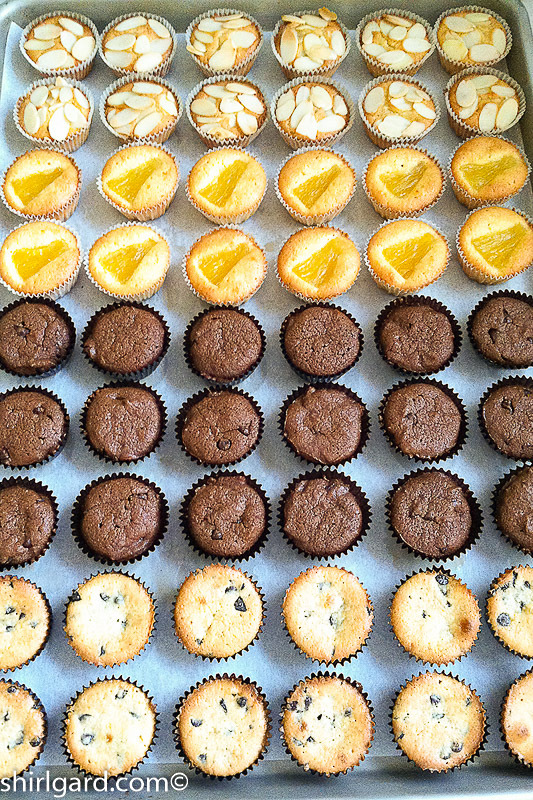 This recipe adapted from Ecole Lenôtre Class - Les Petits Fours n° 2; Plaisir, France (near Versailles) (1996).